We’ve made it to Kings! Is David dead yet? Not quite, but as good as….. you know he must be near death when a young virgin doesn’t revive him (v 1-4). His heirs are already scheming to succeed him, and his officials are choosing sides. What follows is a re-write of the Jacob and Esau story (Genesis 25-27). Bathsheba conspires with Solomon to usurp the inheritance from the eldest surviving son, Adonijah. And David, now ill and senile as Jacob was, grants Solomon the throne. One small hopeful sign, though, is that after the takeover, Solomon spares his brother Adonijah rather than slaying him. What is this? As the World Turns meets The Sopranos? Screenwriters couldn’t create characters and plot twists any crazier than this. 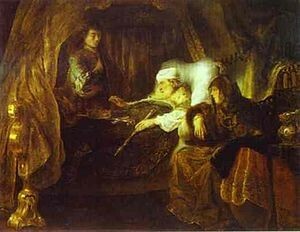 David dies (finally) after farewell words to Solomon that turn bitter. Conniving to the end, he commands Solomon to execute Joad (David’s general), and he finds a loophole in his promise to spare Shimei, (the guy who mocked him in 2 Sam 16:5-10, and who he forgave in 2 Sam 19:19-22), by assigning that killing to Solomon as well. Adonijah has one small favor to ask of Solomon – to marry David’s last young virgin from chapter 1. And that sends Solomon over the edge. Perhaps he sees the request as an attempt at sexual one-upmanship, and/or a grab at power and status. My hope for diminishing violence was in vain; I should have known better. Solomon goes on a killing spree, cleaning house to eliminate all possible rivals, including Joad; Adonijah; Abiathar, the priest (only banished, not killed, because he had carried the sacred Ark); and lastly, Shimei. Well that’s one way to establish yourself as top dog.